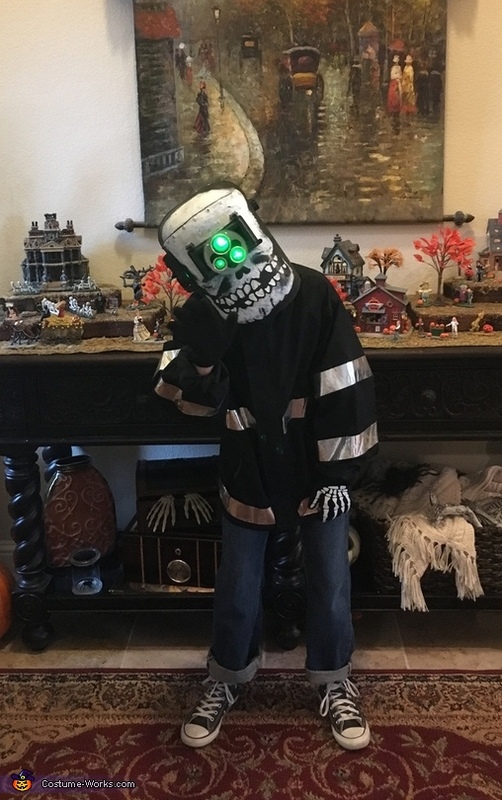 My 10-year-old son Jameson is wearing the costume. Our whole family loves the movie “Coraline” so we were excited to create Wybie. I first hand painted the skull on a simple black welders helmet. We removed the turret lens from an old camera and mounted it on the helmet. We added green led mini lights behind the lenses and mounted a crank on the side. The jacket is a black raincoat with duct tape for the Reflective stripes. A pair of skeleton gloves completes the look. Hey, great work! Not sure how long ago this was, but I'm working on a Wybie helmet myself, and I was wondering what you did for the crank on the side? What did you use, and how did you mount it? Does the crank actually turn? Thanks!